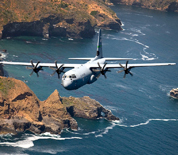 The Channel Islands Air National Guard Station home to the California Air National Guard 146th Airlift Wing whose mission is to provide global military airlift capability to state and federal agencies using the C-130 Hercules. The aircraft are equipped with the Modular Airborne Fire Fighting system which is capable of dropping 3,000 gallons of water or fire retardant. This Channel Islands ANG Station directory features the critical info you’ll need to navigate through the many facilities and recreational opportunities available on base.